What is your company doing to turn business development into something sustainable? Increasingly, the data shows that organizations taking initiative to address climate change are positioning their business to succeed both in the market and as advocates for social change. Sustainable development isn’t just about improving the world for future generations — it’s a meaningful purpose for today and tomorrow. Three trends — decarbonization, decentralization and digitalization — will forge the transformation to the next economy, the Digital Economy. Alongside those trends, energy consumption will increase by 50% in the next 40 years. This means we must cut greenhouse gas emissions in half if we want to keep the global temperature increase under two degrees and manage the pollution of cities at a bearable level. In order to do that, we have to decrease our carbon intensity and improve our efficiency by a factor of three. These realities pose both great challenges and great opportunities for South America. South America is a developing region with great potential. With more than 400 million inhabitants and projected growth of 1.8% in gross domestic product in 2018 according to the International Monetary Fund, the continent is well positioned for an era of innovation. However, the region’s potential growth — if managed irresponsibly — could pose a great threat, contributing heavily to climate change. This means that, at this critical moment, opportunity and responsibility are packaged together. Businesses have a duty to step up and address climate change, but in doing so, they will not only work toward creating a healthier planet, but will also have the potential to realize significant business growth. At present, it is essential that companies, governments, and citizens have sustainable practices firmly set in their agendas and routines. Thinking about sustainability goes beyond the planting of trees or the immediate compensation of damages done by each business. Especially for companies, sustainability and its possibilities today should — and must — be seen as a business opportunity. To develop a healthier world and resilient businesses, it is essential that we work to dismantle the traditional business model in place today. Business leaders should seek to transform their organizations by placing sustainable development at the center of their strategy alongside other core business practices. Already, the available data clearly supports this vision. Data from the United Nations Environment Programme have already shown that the destruction of nature causes annual losses of up to US $4.5 trillion. On the other hand, more United Nations data shows that companies focused on responsible innovation — while respecting the environment — grow at annual rates of 15%, while their unsustainable competitors remain stagnant. Companies seeking to better understand the urgency of developing a sustainable business can look to the 17 Sustainable Development Goals (SDGs) and their 169 targets set by the UN Global Compact. They provide a clear picture of the impact that sustainable action — or inaction — can have on the environment. More than 2.3 billion people have poor access to energy. Water scarcity affects more than 40% of the population. With this in mind, It’s important to understand that sustainable development benefits billions of people worldwide, particularly the poorest populations. SDG7: Access to energy — Outside large capitals and large urban centers, 1.1 billion people still live without access to energy, which harms the economic and social development of people in these areas. This cause and effect is clear when it is understood that societies with better energy-consumption habits have higher Human Development Indexes. The recurrent energy supply allows the acceleration of economic activities and, consequently, the insertion of more people into the labor market. For example, in a rural area, electricity allows for acceleration in processes and contributes to the gradual increase of production. Or, in a small village, energy allows a commercial establishment, such as a store or a restaurant, to keep its products refrigerated, increasing the business’ durability. Not to mention that the provision of energy is vital for access to better healthcare, education, and security. SDG12 & SDG 13: Climate Action and Responsible Consumption and Production — What is good for the climate is good for the economy. The global demand for infrastructure investments in transport, energy, water, and urban development is estimated at around 6,000 billion US dollars per year over the next 15 years, while 270 billion US dollars per year would be sufficient to develop low carbon infrastructures. Schneider Electric has introduced science-based targets to help companies, as well as our own businesses, to capitalize on the opportunities of the new energy landscape. Technological innovation can help businesses consume less energy, become more efficient in use of resources, and decrease carbon emissions. 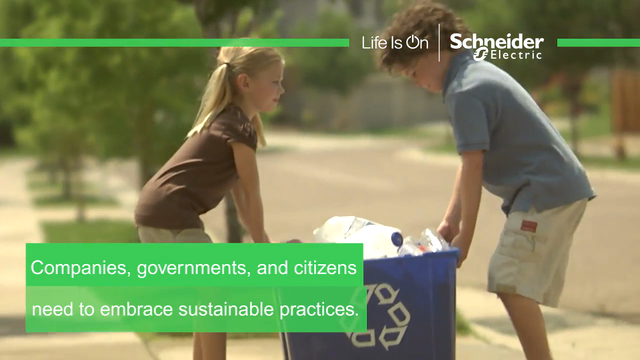 Our EcoStruxure platform is at the core of this transformation. Energy efficiency and automation play a fundamental role, while integrating the whole energy value chain, making energy safe, reliable, efficient, and sustainable. SDG5: Gender Equality — Due to cultural factors, women today are still at a disadvantage in the labor market according to the Gender Gap Report 2017, released on November 2, 2017. And according to the World Economic Forum, it will take 100 years to close the income gap and 217 years to achieve workplace equality. This difference is having a large economic impact. An analysis by the McKinsey Global Institute in 95 countries suggests that US $28 trillion would be added to the global economy by 2025 if all countries achieved full economic equality between men and women. With all of this, it is impossible to think about — or practice — sustainability without taking social inclusion into account. And, beyond the role of governments, companies need to understand that they play an important part in such an urgently needed transformation. Companies must have a clearly communicated sustainability strategy that shows awareness, concern, and action toward addressing these issues. Inaction is not an option. The numbers clearly show that the world is watching and the environment depends on it. And finally, there is no way to lead a successful business without considering what real solutions it will deliver to the emerging issues of today’s world. So, the question remains. What is your company doing to turn business development into something sustainable? In other words, is your company taking meaningful action today to place itself and the environment on firmer footing for tomorrow?